For indigenous people seeking health care in Mexico and the United States, the biggest barrier must be language, Dalila Vázquez Herrera thought. An Emory College senior majoring in Spanish and biology, Vázquez had already taken a class in which she explored negotiations between traditional and Western practices of healing for Mixtec speakers in rural Mexico. But diving deeper as one of 14 grantees in the Scholarly Inquiry and Research at Emory (SIRE) program, she found that cultural communication — not simply language — proved to be a barrier for health care delivery. Vázquez had that sense of community growing up in her study town, Yucuquimi de Ocampo, in the mountains in the southern Mexican state of Oaxaca. 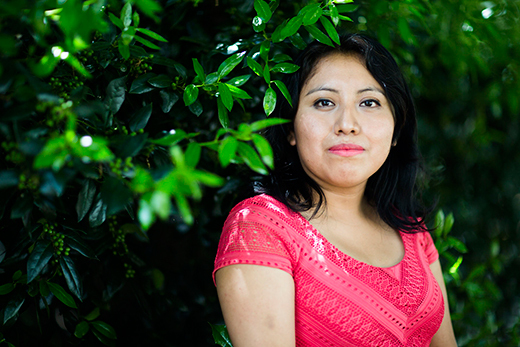 She, too, spoke the indigenous Mixtec language and didn’t speak Spanish until she went to school. And her family sometimes relied on traditional healers for simple care or vitamins. By the time she and her family moved to Brunswick, Georgia, eight years ago, Vázquez had left that history and focused more on modern medicine. She came to Emory planning to go on to dental school. Yet her life experiences and college coursework began to merge when she realized that her language skills gave her the unique ability to ask providers, patients and families about health care and medicine. The results of that research surprised Vázquez. For instance, most of the indigenous patients did not reject Western medicine or care. They simply relied on traditional healers because the language and cultural connections made it easier to talk about their ailments. They were more likely to share information about their lives because of that bond. That in turn allowed the healers to treat patients holistically, knowing for instance about the stresses that could exacerbate medical woes. The level of trust also helped because the healers were quick to recommend Western doctors for more severe medical problems and even routine medical check-ups. The Western medical clinic in town, meanwhile, learned to hire Mixtec speakers to gather patient information but also to discuss more Western concerns, such as public health. Implications for health care in the U.S.
Vázquez’s research shows the need for more funding, and time with patients, for Western medical providers to take hold in indigenous communities. But she also sees lessons for health care workers in the United States. That conclusion doesn’t surprise Karen Stolley, the Spanish professor who mentored Vázquez through her study. The research project has changed how Vázquez plans to contribute. She is taking a year off after she graduates to work in the immigrant community in the United States to better understand medical care and issues here. Then, instead of dental school, she plans to pursue a Master’s of Public Health to continue delving even deeper into the same research.